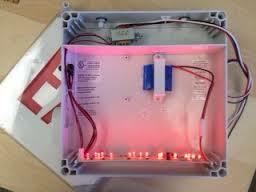 We sell, install, and service all types of exit and emergency lighting. So, if you’re a restaurant owner thinking about installing emergency lighting in your dining room, a contractor wanting to supply an entire industrial building with exit signs, or if you’re looking for something in between, contact Atlantic Fire today. Inspect the lighting system to determine whether it is in service and in satisfactory condition in accordance with NFPA standards. Conduct a complete test of the lighting system to ensure it will illuminate a minimum of 90 minutes (OSHA, NFPA and NEC minimum standards). Adjust the PC board float voltage. This will ensure extended life of the batteries and other key components. Inspect all bulbs and lamp heads to ensure they are operational and meet lighting requirements. Clean all battery terminals and leads. Survey the emergency lights and exit signs for proper placement. Check the energy efficiency of the bulbs and lamps. Tag or label devices as required and perform all required record keeping. Identify potential detrimental site conditions that could compromise the performance of mechanical and/or electronic components of the system.